Whenever you hear the word ‘composite,’ it refers to some of the recent breakthroughs in science, technology and medicine. 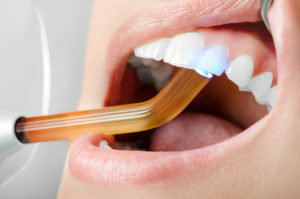 Specifically, a composite filling is a combination of biocompatible plastics and glass that are made into a tooth-colored resin that restores teeth that are chipped, broken or damaged by cavities. How Does the Composite Filling Process Work? Shade Selection – Before the process starts, your dentist will select the correct shade to match the natural color of your teeth. Etching – The next step is to etch (roughen) the tooth and coat it with a conditioning compound that prepares it to adhere to the composite material. Resin Application – The resin compound is then added, smoothed into its proper shape and hardened using an ultra-violet light. After these steps are completed, your dentist will trim the tooth a final time and polish it. In total, the process takes around 30 minutes. When it’s done, you’ll leave the office fully restored. The silvery restorations that we referred to earlier are called amalgam fillings and represent the “old guard.” They used to be the preferred method for filling cavities because they offered a low-cost alternative for gold fillings. Toxicity – They contain mercury, which is extremely toxic. Sensitivity – Amalgams are temperature-sensitive, meaning they expand in warmer temperatures and contract when it’s cold. This movement can lead to hairline fractures that cause the restorations to fail. Aesthetics – As mentioned earlier, the amalgams – with their silvery appearance – detract from the appearance of your natural smile. Composite fillings will typically last for at least five years, but their longevity ultimately comes down to how well you care for them. With excellent oral hygiene and the maintenance of regular dental visits, you can enjoy a lasting restoration and beautifully, functional smile for much longer. To learn more about how you can be restored with composite fillings, reach out to your dentist to schedule a consultation today. Dr. Scott Wehrkamp earned his dental degree from Loyola University Chicago School of Dentistry. He has since gone on to deliver top-notch care for nearly forty years. A highly-skilled professional, Dr. Wehrkamp has attained Accredited status in the American Academy of Cosmetic Dentistry (AACD) and is a Fellow in the International Congress of Oral Implantology. He restores smiles with composite fillings at Wehrkamp Dentistry and can be reached for more information through his website.